A feedback loop is system structure that causes output from one node to eventually influence input to that same node. For example, the work output of a population can increase the goods and services available to that population, which can increase the average life expectancy, which can increase the population, which can increase the work output still more, and the loop starts all over again. Using system dynamics notation, this feedback loop would look like the Population Growth loop shown. 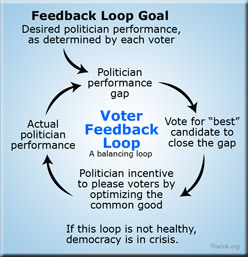 A critical example of a feedback loop is the Voter Feedback Loop. This loop is the foundation of modern democracy. You may have noticed that democracy is in crisis. It's unable to solve important common good problems like war, climate change, discrimination, and excessive income inequality. It's also unable to solve the hate-based authoritarianism problem, as seen in the recent rise to ascendance of Vladamir Putin and Donald Trump. One of the intermediate causes is that the Voter Feedback Loop is in trouble. Thus this loop must be understood if we are to become able to dig deeper and uncover the root causes of why democracy is in crisis. Here's how the loop works: When citizens decide who to vote for, they compare desired politician performance to actual politician performance. The difference is the politician performance gap. If the gap is low it hardly matters who to vote for. Otherwise, people vote for the "best" candidate to close the gap. Politicians know voters think this way, which causes a politician incentive to please voters by optimizing the common good. By standing for the common good, politicians can attract a majority of voters and win elections. Once elected, politicians engage in actual politician performance and the loop starts all over again. The Voter Feedback Loop is a balancing loop because the goal of the loop "balances" the behavior of voters to slowly but surely drive the behavior of politicians to be the same as the goal of the loop, as the gap gets smaller and smaller. Balancing loops are also called goal-seeking loops. Like the way the setting of a room thermostat drives a heating and cooling system to the preferred temperature of the room, the goal of the Voter Feedback Loop drives a democratic system to the preferred state of "good" performance of its politicians. 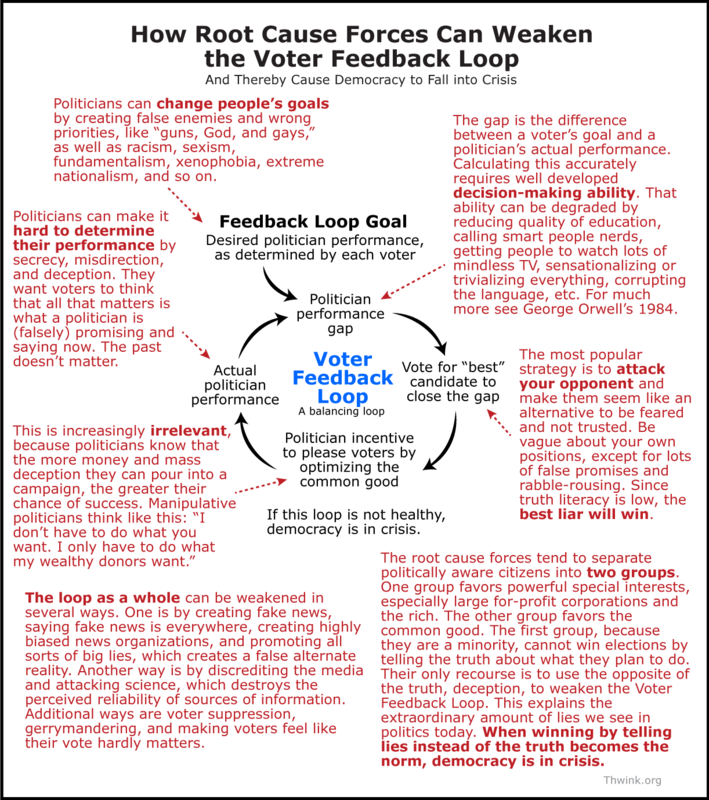 The Voter Feedback Loop contains enormous power, since it's the fundamental driver of democratic governments. But it's far from mature and easily exploited. Powerful root cause forces are working to weaken the loop, as the annotated version explains below. "When winning by telling lies instead of the truth becomes the norm, democracy is in crisis." While the Population Growth example may seem simple and obvious, that's because we drew a simple model with only one loop and 4 variables. Few real world problems are as simple. For example, The Dueling Loops of the Political Powerplace model has 43 variables, 3 main loops, about 5 additional loops, and 4 stocks. It is a simplification of a larger model that has 123 variables, 11 stocks, and countless loops. Its construction took a single person several years. Another example is the World3 model in Limits to Growth, which contains about 300 variables and 20 stocks. It took 17 researchers 2 years to construct the model. 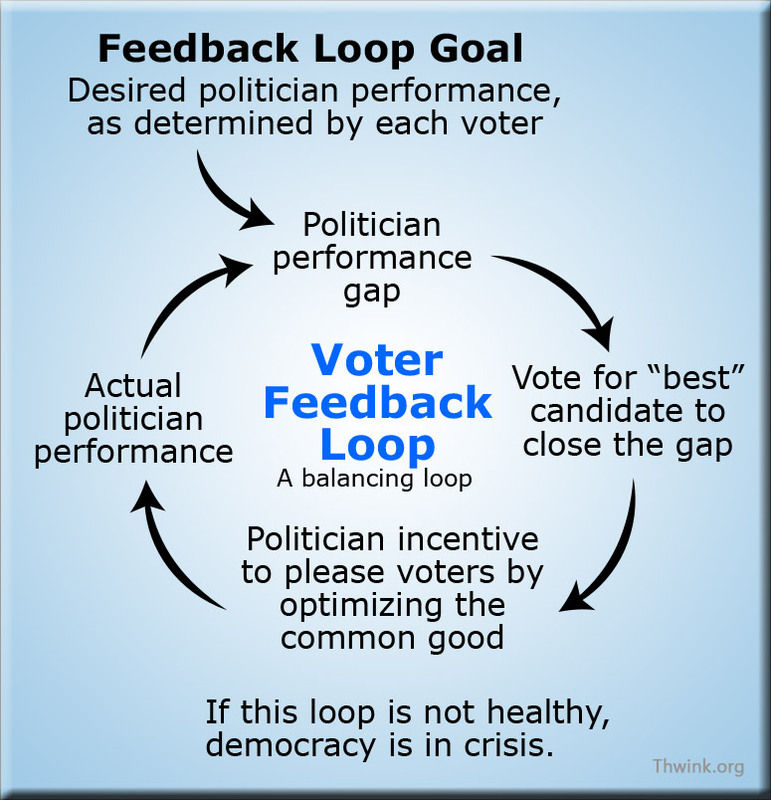 The Voter Feedback Loop is a simple loop for educational purposes. Much more detail would be needed, in a simulation model, to deeply and correctly determine how the loop works and how it's being weakened by those seeking to subvert the democratic process for their own gain. Understanding the behavior of difficult complex social system problems well enough to even begin to hypothesize a realistic solution, with a high probability of working the first time, is impossible without understanding the key feedback loops involved. The universe contains only two kinds of feedback loops: reinforcing and balancing, also called positive and negative feedback loops. 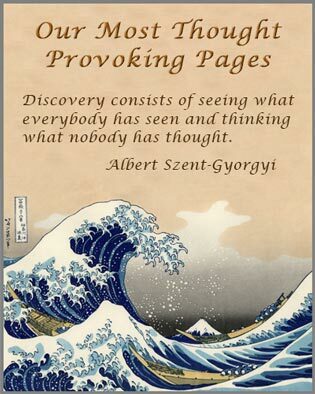 Once you grasp how they work you are well on your way to understanding the foundation of systems thinking. A feedback loop occurs when a change in something ultimately comes back to cause a further change in the same thing. If the further change is in the same direction it’s a positive or reinforcing loop. If it’s in the opposite direction it’s a negative or balancing loop, also called a goal-seeking loop. 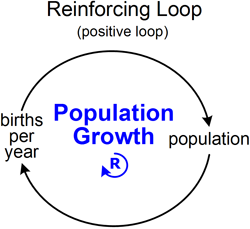 An example of a reinforcing loop is Population Growth. As population goes up, so does births per year. As that goes up, so does future population. The loop goes round and round, growing exponentially until the loop hits its limits, which are not shown. 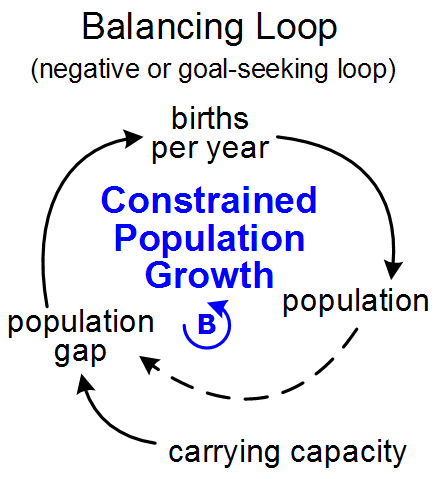 An example of a balancing loop is Constrained Population Growth. Here the constraint is carrying capacity, which is the maximum number of people a system can support. Population will grow until it reaches this constraint, also known as a limit or target. Let's call this one a limit. In a balancing loop the gap equals the limit minus the actual state. Suppose the carrying capacity is 100 people and population starts at 10. That causes a population gap of 90. This increases births per year to a high rate. As that goes up, so does population. As population rises, the population gap falls. This lowers the birth rate, which (over a long period of time) lowers population, which increases the gap, which increases the birth rate, and so on until the gap approaches zero. This behavior causes population to gradually approach the carrying capacity of the system, since the system can support a limited number of people. In practice population will tend to overshoot carrying capacity and suddenly collapse, due to long delays in environmental degradation. Every time a balancing loop goes around, it behaves in the opposite manner than it did before, since a balancing loop contains an odd number of inverse relationships. A reinforcing loop contains an even number of inverse relationships. A solid arrow indicates a direct relationship. A dashed arrow is an inverse relationship. Understanding how balancing loops behave can be tricky at first. If so, do what we did. Draw a few reinforcing and balancing loops on paper. Trace them around until things start to become clear. 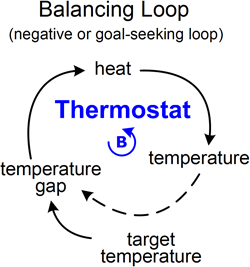 Another example of a balancing loop is a Thermostat. Suppose you set the target temperature to 65 degrees. The higher the target the greater the temperature gap. The greater the gap the more heat that flows into the system. That increases the temperature. As this goes up the temperature gap goes down. It keeps going down until the gap is zero, at which point the system has reached the target. These are causal loop diagrams. They can't be simulated but are very useful for simple or high level feedback loop modeling. Arrows indicate that one node influences another. Solid arrows are a direct relationship. One node varies directly with another. If A goes up then so does B, or if A goes down then so does B. Dashed arrows are an inverse relationship. If A goes up then B goes down and vice versa. As simple as models like these are, they can allow problem solvers to understand the relevant behavior of complex systems well enough to solve surprisingly difficult problems. The main challenge in social problem analysis is to figure out what the most important feedback loops driving a system’s behavior are and then what they should be. While large social systems contain millions of loops, the decisive behavior of any specific problem is controlled by only a few of these loops. These determine the basic structure of a system, which is the shape of the important loops defining the system’s behavior of interest. The First Law of Modeling states that if you don’t understand a system’s key feedback loops then you don’t understand the system. But once you do understand them you are a giant step closer to controlling the system’s behavior. Feedback loops control the behavior of a system over time, as shown by the graphs above. Reinforcing loops cause either runaway (1) exponential growth or (2) exponential decline. For example, the world’s population began growing exponentially when its limits were suddenly raised by the fruits of the Industrial Revolution and modern technology. Balancing loops cause (2) goal-seeking behavior. In a balancing loop a quantity such as temperature will grow rapidly for awhile and then slow down, as it homes in on its goal. A balancing loop with a delay causes (4) oscillation around the goal of the loop. The loop is continually overshooting and undershooting the goal due to the information delay. It learns too late when it should correct its growth or decline. For example, most thermostats oscillate around their temperature goal by a few degrees. All realistic models have at least one reinforcing and one balancing loop. An exponential growth loop combined with a goal seeking loop and a small delay causes (5) S-shaped growth with small overshoot. As the delay for correction to the goal grows, the overshoot becomes so large that the perfect approach to the goal shown in graph 5 becomes impossible. The results is (6) S shaped growth with large overshoot and collapse. This is the plight of Homo sapiens today. Due to high systemic change resistance, solution delay has caused large overshoot. The larger the overshoot becomes the more likely a large collapse becomes. NOTE - The above six graphs were reconstructed from nearly identical ones in John Sterman's Business Dynamics: Systems Thinking and Modeling for a Complex World, page 108. Sterman makes the important point that "The most fundamental modes of behavior are exponential growth, goal seeking, and oscillation." The additional three graphs are merely combinations or variations of the three fundamental modes. In complex systems, problem symptoms arise from the forces generated by a system's key feedback loops. The construction of these loops must be understood to solve the problem. There are two main tools for doing this: causal loop diagrams and simulation modeling. Causal loop diagramming is a much simpler and easier to learn method. The feedback loops in this page are an example of causal loop diagrams. Learning how to draw causal loop diagrams is the place to start if you are learning how to use feedback loop thinking to solve difficult problems. Simulation modeling is the other method. Here you use software to describe the feedback loops that cause the problem. This creates a simulation model of the problem. Running the model creates graphical output of how the system with the problem behaves over time. For general purpose use, Thwink.org recommends system dynamics as the most appropriate simulation modeling tool for difficult social problems.